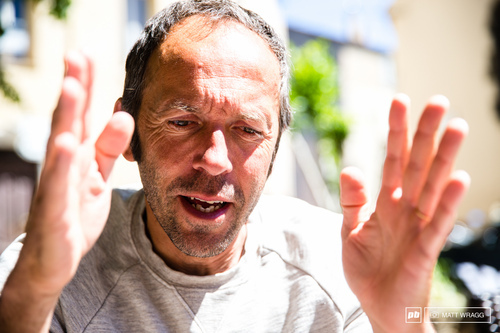 Zoobab is the other name of Jean-Pierre Garnier, the famous designer of the great Sunn Bicycles era (like the 1995 Sunn catalog, a piece of art), designer of Commencal bikes, and he is now designing Urge helmets. Jean Pierre alias Zoobab était designer chez Sunn. Son mode de vie me faisait rêver. Il bossait quand il voulait, voyageait, dans le milieu du bmx. Je me suis dit: "quand je serais plus grand, je veux faire Jean Pierre Garnier comme métier maintenant." Et puis arrive Jean-Pierre Garnier, plus connu sous sa signature de graphiste : Zoobab n’a pas quinze ans lorsqu’il envoie à Sunn ses premiers dessins de mousses de cadres. La patte est déjà là, et il devient très vite le graphiste attitré de la marque, lui donnant durant de longues années un style très particulier, qui sera pour beaucoup dans son succès. Working in design for 20 years, he grew tired of modern society's consumerism and wastefulness, and of modern business practices, leading to a major lifestyle change. He currently lives in a small village in Provence in the south of France where he runs URGE Bike Products, does freelance design work and lives a simple, modest and natural lifestyle. A funny and bright character, he loves MTB, surfing and animals. Everything at Leon Bike from the basic concept to production is performed with the huge goal of preserving the global environment and reforming peoples' lifestyles and business practices. An interview of him at Eurobike. Another good interview at Fresh ITW. Great Pinkbike article about Urge helmets.